A statement this week by Donald Trump received little attention yet offered a peek into his worldview. Government ‘involves heart,’ unlike business. During an interview with AP correspondent Julie Pace, Trump was asked whether there were business skills that did not connect with the job requirements of the presidency. “Well in business, you don’t necessarily need heart, whereas here, almost everything affects people,” Trump said. “So if you’re talking about health care — you have health care in business but you’re trying to just negotiate a good price on health care, et cetera, etcetera… Here, everything, pretty much everything you do in government, involves heart, whereas, in business, most things don’t involve heart. In fact, in business you’re actually better off without it,” Trump said. It’s true that business still has a way to go in the heart department. But having taught business (full time and part time) since 1999, this “heartless” sentiment has been slowly drained from the business ethos. Sure, it creeps back in from time to time, as the recent Wells Fargo scandals, problems at Uber and the mess at United Airlines, all reveal a lack of heart. Still, these companies made news precisely because they were heartless, not because they were examples of a caring enterprise. Such views of the heartless business ethos are the legacy of a bygone era. Trump’s views locate him back in a 1970s business model focusing on profit and production with little time for care or values. A time when leaders amassed power and authority to exploit resources to benefit the bottom line. This narrow salesmen’s view seems to have formed his mindset about industry and commerce, which he has mapped onto society. But alas, since then business education and practice not only grew beyond this limited view of industry; this view is now scrutinized in case-studies as the antithesis of the modern-day enterprise. Yet, Trump seems locked into this outmoded, even antiquated, transactional view of business (and life), fixed on exploiting others. Indeed, we are entering our third cycle of business evolution — beginning in the mid-80s — that has expanded our values to include transparency and accountability to include more voices that help shape and impact organizational life. In each wave, we’ve expanded how “values” have become more critical to becoming sustainable. The grid above views each era of change in management culture from 1985 to present-day. Each era expands values to our Third Wave, concerned with ENGAGING CULTURE, beyond a “corporate culture” imposed on workers. We are now in an era of cultivating VALUES that foster partnership, cooperation, multiplicity, and collaboration. 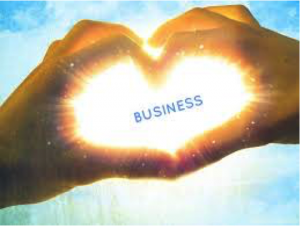 More than four decades of research has transformed the heartless business ethos from its sole focus on products, profit and production to include a focus on purpose, people, and principles. This history of this transformation includes some key contributors. 1990s- Peter Senge, and Fred Kofman, researchers at MIT in 1991, authored a seminal paper “Communities of Commitment: The Heart of Learning Organizations” in which they proffered ideals for developing learning communities in the face of this accelerated pace of change. Overcoming, however, is part of the very mindset that generated the problems. Fragmentation, competition, and reactiveness are not problems to be solved‐‐ they are frozen patterns of thought to be dissolved. The solvent we propose is a new way of thinking, feeling, and being. Fragmentary thinking becomes systemic when we recover “the memory of the whole,” the awareness that wholes and parts operate in a circle of self-generation. Competition becomes cooperation when we discover the “community nature of the self” and realize that our role as challengers is to help each other excel. Reactiveness becomes creating when we see the “poetic power of language,” how language brings forth distinctions from the undivided flow of life. Model the Way: a) Find your voice by clarifying personal values; b) Set the example by aligning actions with shared values. Inspires a Shared Vision: a) Envision the future by imagining exciting and ennobling possibilities; b) Enlist others in a common vision by appealing to shared aspirations. Challenges the Process: a) Search for opportunities by seeking innovative ways to change, grow, and improve; b) Experiment by constantly generating small wins and learning from mistakes. Enables Others to Act: a) Foster collaboration by promoting cooperative goals and building trust; b) Strengthen others by sharing power and discretion. 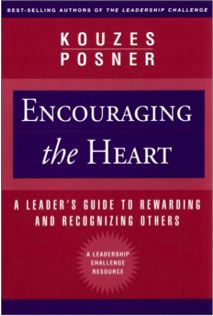 Encourages the Heart: a) Recognize contributions by showing appreciation for individual excellence; b) Celebrate the values and victories by creating a spirit of community. That last point is the title of one of their books, Encouraging the Heart, published in 1999. Critical work by Daniel Goleman (1995, 1998, 2002) and Richard Boyatzis (2001, 2002) increased our awareness of how to talk about emotions in organizational life, as Goleman developed Emotional Intelligence (EQ/EI), as a valuable source of information that leaders can consult more readily than most others. Goleman’s work popularized five main elements of emotional intelligence: self-awareness, self-regulation, motivation, empathy, and social skills. James Collins (1994, 2001, 2011) has challenged our fundamental notions of leadership. His management classic Built to Last (1994) identified the importance of Core Ideology and Envisioned Future, declaring that profit is a goal, not a purpose. Later he researched 1400 companies (detailed in his book Good to Great) seeking out qualities that transformed companies to “greatness,” and then identified a leader, not as a personality profile, but as leadership character. At the top of his model, Collins uncovered that all great organizations were headed by what he called “Level 5 Leaders.” These Leaders have a unique combination of fierce resolve and humility. A personal favorite that explodes the myth that “nice guys finish last” comes from Fortune 500 consultant and author James Autry in his book, Love, and Profit (1992, 2004), disabusing us of the false choice between the cold, hard business and the softer, caring culture. The 2017 business lexicon includes social venture capitalists, funding social entrepreneurs and social enterprises that deliver social impact on a large scale. Indeed, the emergence of the Tipple Bottom Line – People, Planet, Profit (1994) has raised awareness of expanding concerns to include care. All of this movement leads with the heart. This is all part of an emerging business model today – unimaginable if viewed through a 1970s lens. When one shifts their view to sustainable– as revealed by the research presented – we find ways to include others, to succeed beyond winning; to play the long game, collaborate, and consider a larger vision and future. We let go of transactions in favor of relationships; let go of one-off deals in favor of sustainable agreements; and, let go of achieving short-term gains in favor of generating commitment. Heart is primary to generate commitment in all organizations to better serve customers, retain quality employees, and lead by listening and serving. Where humans are involved, there is always heart – whether in government, education, non-profits and yes of course, in business – it’s up to leaders to cultivate that heart. Often the leader assessing a lack of heart is projecting rather than describing reality. Let’s not conflate managing an organization with winning a campaign. The purpose of a political campaign is to win; to govern manifests a set of principles. However, when winning is all that matters, then the campaign truly never ends.